I found the best ant bait ever! I have tried numerous brands but they don’t work. Being an engineer, I tore up the ant baits. Seriously, the stuff inside doesn’t look like it’s going to bait anything. 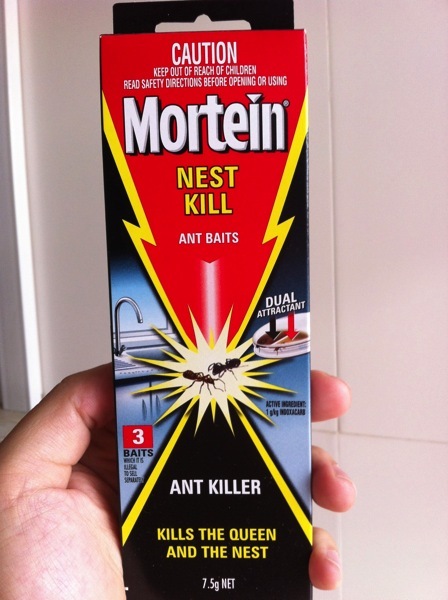 It’s until I found this Mortein ant bait some time back. The bait inside, looks like peanut butter. I’m not sure whether it tastes like peanut butter of course. Brave ones can go try it out. What I do is I try to locate the spots where the ants surface, like cracks etc at the sides of the wall. 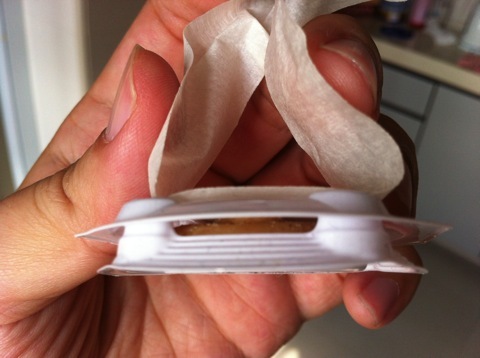 Just stick one of these near the crack and very soon you see ants anxiously picking up the ‘food’ from the bait. I don’t see such eagerness with other baits. This stuff must be tasty. Within 2 – 3 days, nothing will crawl out of the cracks. What this thing does is that it baits the ants and make them carry the ‘food’ back to the nest. They feed the queen with the ‘food’ and in the process killing it. Hence, the whole reproductive cycle is disrupted. Within a few days, the old ants die and no new ants are hatched. This is how the box looks like. It’s available in supermarkets. Forget all the other brands, trust me. This is the best.